I'm currently at the age where most of my friends are getting married and having, or about to have, babies. Whilst evading these rites of passage myself for the time being, this new period does seem to be providing a test of my sewing flexibility. Can I make wedding appropriate atire? Yep. 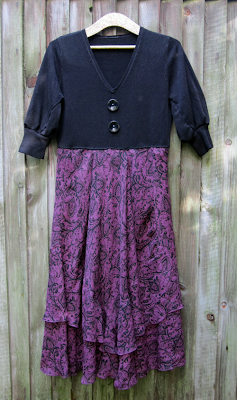 Can I make little peoples' clothing? Yep, again! Phew. I made this little dress over the course of a week and a half for my friend who is due to give birth in three weeks, and finished it just in time for her baby shower yesterday. It's the first baby or child garment I've ever made from scratch and I thoroughly enjoyed the process (after the initial 'what, this sewing project isn't for me?' phase that I have to go through!). It was made from fabric that the parents-to-be bought back from their honeymoon in Africa. 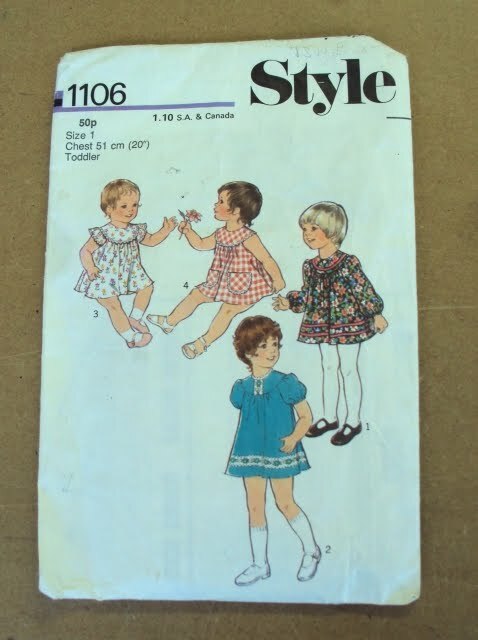 I used this vintage pattern pictured above that I found in a flea market recently, which was published in 1975. 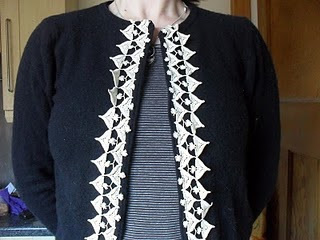 I made view 3 with the frilly sleeves, but would love to make the other versions in different fabrics. 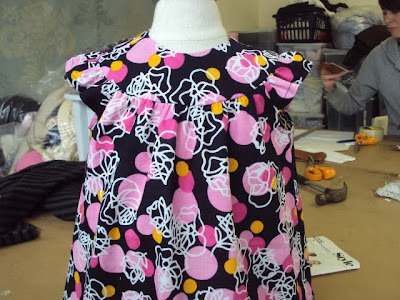 Unfortunately, the pattern was for size 1 year, so we'll have to wait a while to get a modelled shot. That said, I did put it on the bizarre child's mannequin (which is sized for 3-4 year olds) that hangs around at work to get a bit of an idea what it'll look like when 3D (see below). There is something so adorable about little things isn't there?! Plus something this small was surprisingly quick to make. Now I've got the construction process down, I think I could whip one of these up in 2.5 hours including cutting (there's a bit of hand-sewing involved). Next task: boy-baby or unisex appropriate garments, possibly using stretch fabric. Fear not Umi, Emma, Anna etc., Auntie Zo is getting her sew-on! Me-Made-March '11: The Flickr Group Lives!!!!!!!!!! Not the most sophisticated logo ever, I grant you! But there she is, stitching up a storm all ready for the onset of Me-Made-March '11! I hope everyone is as excited as I am. I'm sure you know how this whole self-stitched challenge works by now. All participants have already made their own particular challenge specifications to dress by throughout March. So, you wake up in the morning of March 1st, put on your rocking outfit comprising of or including self-stitched items, and then what? Maybees you want to share your awesome look with others who are in the same boat. And come to think about it, wouldn't it be cool to see what the other participants are wearing too? What would be the quickest and easiest way to do those things? Umm? Through the new MMMar '11 Flickr group of course!!!!!!!!!! So if you have signed up as a participant of MMMar '11 with a Flickr account, head on over and sign up to become a member. That way you can post your daily outfit pics to the MMMar '11 photo pool, comment on other peoples' photos, get involved in related discussions or start your own discussions. PLEASE do not upload more than two photos of each day in March. With so many people participating, there will be thousands of photos. It will keep it more managable and equal if each person only shows one or two outfit pics for each day. If you have lots you want to share with people, you could include a link in the description section of your pool photo which includes your blog address where those who wish to see more of a particular garment/outfit can do so. You do not need to post outfit photos on the actual day you wore the outfit, you are welcome to upload a whole weeks worth in one go if you wish. Whenever is most convenient for you. Please do not use this group for simply displaying your latest projects unless they are forming part of an outfit you wear during the challenge. That's what Burdastyle is for! For obvious reasons, please do not add a photo to the group pool until March 1st, though if you wish to start a discussion sooner, please go ahead. It might take a couple of days for your membership to the group to be activated, it is not an instant action. Most times you should find you are a member within 12 hours. Any questions, please leave a comment and I'll be happy to clarify anything. It's a free and easy group, I just needed to sharpen up a few points to make this the best and most enjoyable me-made/self-stitched challenge yet! What am I looking all chuffed about in the picture about? 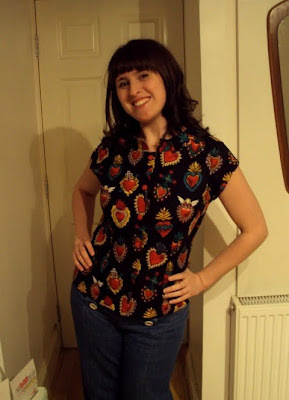 Well, I've finally finished sewing myself a new super-cute blouse! I've been pretty busy recently, what with co-organising Brighton Craftaganza, thinking about and planning MMMar '11, worrying about ecological damage and social injustice, trying to make the best out of my unstable work position, plotting and scheming towards new creative ventures, making new connections and friends with local creative peops AND hunting for a new flat, but it'll be a cold day in hell when I'm not in the process of expanding my wardrobe by having a sewing project on the go! 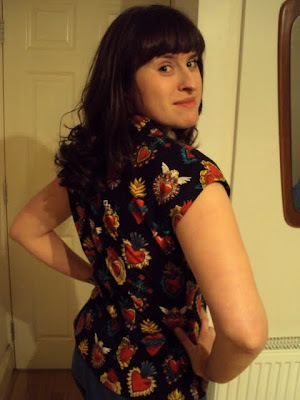 Maybees you remember this awesome blouse pattern from my Recent Acquisitions post a while back? Well, despite having bought a frigthening number of patterns since writing that post, I am ever-committed to using all the patterns I have at least once, otherwise they get passed on, and I've been particularly excited about trying this blouse pattern. 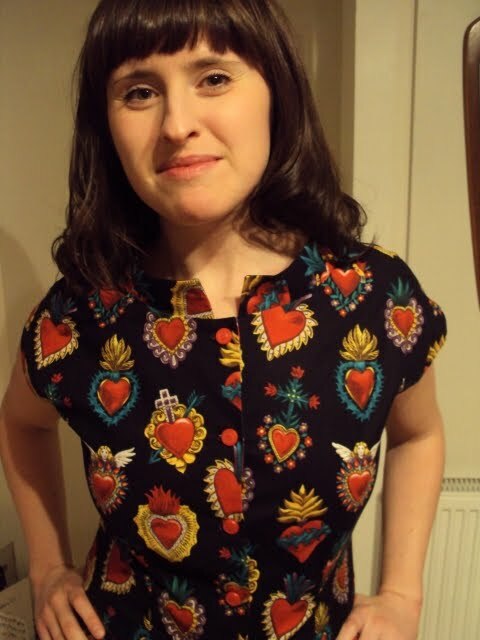 It was tricky to decide which of the variations to try first, but I think the Corazones fabric leant itself best to view C.
This fabric was actually a gift from my mates, along with some other amazing super-special fabric, for my 30th, which was a year and a half ago now. I'd been hanging onto it, waiting for the right project to come along. I took my time with this project. I often find it's the garments that look the simplest that you have to take care to get a good fit. I traced off the original pattern, as I always so with my vintage babies, and added some extra width at the waist and hips. 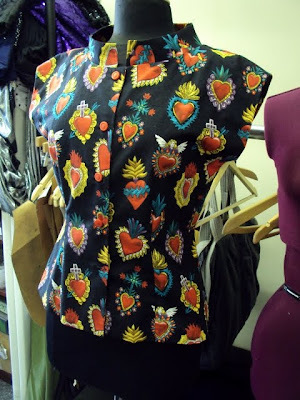 I cut out the blouse and stitched the shoulder and side seams, THEN pinned the darts, so I could get a decent fit for my shape. I probably should have got my boss to help fit the back, but it's so cold in our workroom that I could onlt bring myself to fit a blouse after the heating in my flat had been cranked for an hour before I could peal off my layers of clothing! I massively LOVE the standup collar. So simple but such a nice feature. 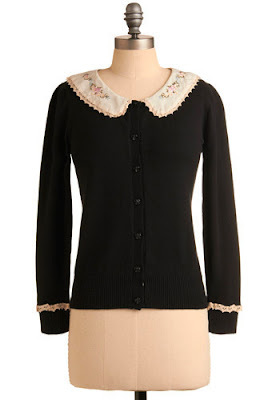 However, it does put one fly in the ointment: it makes it tricky to wear a cardigan over the top without squashing down the collar, which kind of spoils the how effect of the blouse. I'm either going to have to seak out a secondhand cardi that doesn't have the round 50's cardi neckline I tend to do for, OR I could fashion a cardigan with a wider neckline than my current selection of cardis provide, OR I'm going to have to wait til it's warm enough to wear without a cardi at all (that could be a LONG wait!). I did actually make the bow section as per view C, but it looked wierd with the all over print so I took it off. That meant I had to re-jig the fastenings. I only had four of these sweet vintage buttons, which worked out ok when the bow was present because the top had a popper. 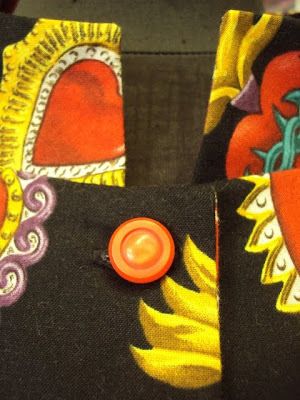 But when the top bit was exposed, I had to make another button hole and move the bottom button to the top and sew closed the bottom button hole and stitch popper there instead. 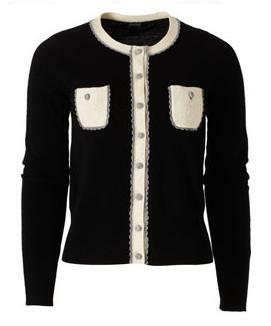 So, if I figure out the cardi sitch, expect to see this cutey pop up during MMMar '11! How are you preparations going for MMMar '11, if you have chosen to take part? Have you got any any bits completed since signing up? 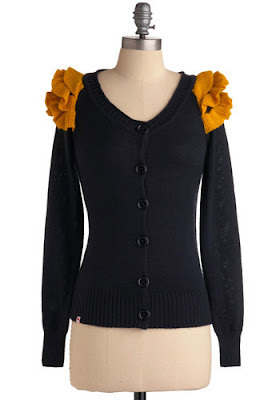 So, Refashionistas, have you been feeling somewhat lonely since the Wardrobe Refashion blog/community came to an end? Been missing the wealth of tips and inspiration that it provided? Wish there was some place you could share your latest refashions and receive the advice and (well deserved) praise that WR could be relied upon for? DON'T WORRY!!!!! The Refashion Co-op is here to make everything better! I first heard about the Refashion Co-op (RC) when it existed only as an idea, when its inventor Eddie contacted me to do an interview about my life as a refashioner (which can be found here). The day we conducted the interview we were both at our respective homes, having been snowed in and unable to go to work, and I got to hear all about her excited plan for making a new home for the online refashioning community. I can't believe she has taken her idea to full fruition in such a short space of time! Having had the idea and put in all the hard work designing and promoting it, Eddie then went and did something incredibly self-less: instead of sitting back and sucking up all the praise and credit as the creator/editor, she has gone and made it a co-operatively run venture. This, IMO, is one of the major strengths of the RC. She has found a diverse selection of Refashionistas to become editors of the blog, who each take turns at editing, moderating and whatever else tasks are required during their week. From what I understand, these editors can come and go depending on the stresses and strains of their own lives, and others will no doubt step up in the future. This will ensure that the 'management' of this community blog will always be as vibrant and creative as the refashions you will no doubt find on the blog itself. The content of the blog comes from contributors, in the same vein as WR, Sew Retro and the Crafty Christmas Club. Signing-up details can be found here, something I plan to do very shortly. It is a very exciting thing, witnessing the birth of something that I'm sure will provide so much inspiration and encouragement for many. So what can we expect from the RC? Well, from what I can tell, it will be similar to WR (which I mean in the very best sense) in the way creations are shared and how interaction is conducted. I can't see the rotating of editors as having much of a visable effect on the blog itself. The other main difference seems to be the very handy clear tagging system they have going on, so as the content builds up, you will be able to navigate easily and find what you are looking for in a flash. I like that the contributors can also be tagged so once you find someone in particular whose refashion you admire, you can easily find out what else they have created. What else can I say, other than see you over there?! Let's kick things off with a confession. I massively planned on announcing MMMar '11 weeks earlier than I actually did, so apologies to those participants who would have prefered a little longer to plan and stitch. I've been spending so much time and head space on Brighton Craftaganza since the year began, that it was a shock to me to discover it was February already and I'd, in reality, done f-all about MMMar '11. Thankfully this clearly hasn't put many off because, as I write this, a (lucky) 69 people have signed up so far! So, before I get even more behind schedule, I really should sign-up myself! There, done. The keenest eyed of you may notice that I've changed my approach a bit this time around. Whereas for my three previous challenges I wore nothing but me-mades from scratch, this time I'm including refashioned knitwear which, by my definition, includes sweatshirts, jumpers and cardigans (I believe the collective noun in the US would be 'sweaters'). This decision may look like I'm actually lowering the ante, rather than upping the handmade stakes, so let me explain. By particpating in Me-Made-March (2010), Me-Made-May and Self-Stitched-September following my previous rules, I think I've adequately proved already that I can get by in only me-made clothing, which includes my (incredibly limited) selection of me-made warm tops (Saint Cardigan and the ruffle front jumper, to be precise). 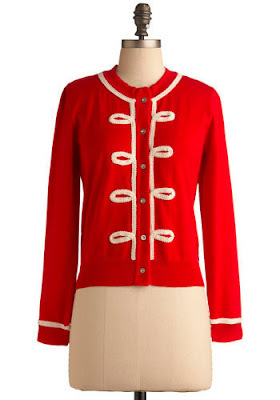 I haven't made any more jumpers or cardigans suitable for a British March, and to be honest I don't really want to. The reasoning behind this is kind of three pronged. 1# I'm just not that into modern knitwear styles and by association, most of the selection of contemporary sewing/knitting patterns available. 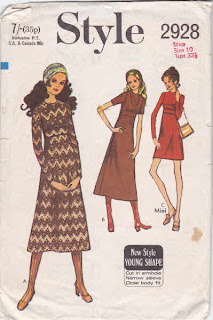 These days, I'm mostly (though not exclusively) into creating things from vintage patterns, and I have never found a mid-century cut-and-sew vintage sewing pattern for knitted fabric. I just don't think they'd developed cut and sew knitted fabric at that time, at least not for retail. I think that came further into the 60's and into the 70's. 3# Refashioning. As you may have read, towards the tail end of last year, I begun to get back into refashioning as a concept. Of course, greatly inspired by the activities of my new job, I've been seeing the creative possibilites in existing old clothing with fresh eyes. Also, I'm not sure I can justify the environmental impact of buying new cut and sew knitted fabric, or balls of wool, when I have ready access to lots of used and very unloved exisiting garments which are otherwise going to be pulped to become polar fleece or something. I have built up a small pile of used jumpers, cardis and sweatshirts that all could use some re-working to make them wearable. I've been slacking on that recently and relying on some old RTW warm tops I have, but I would really like to get these vintagey inspired pieces done and in my wardrobe, so by including them in my MMMar '11 contract, I might actually get round to it before the UK's fleeting summer shows its face! I have hoarded these RTW garment images in my inspiration file to inspire future knitwear refashioning. These garments on the mannequins are from Mod Cloth, the rest are by Orla Kiely. Time to take a closer look at them, me-thinks! Happy stitching peops. Thanks everyone for such an awesome response to the latest handmade challenge! So exciting to see so many new names, but also incredibly lovely to see lots of 'me-made' or 'self-stitched' 'veterans' stepping up to the challenge once again. Something that is particularly cool is that some of the veterans have upped the ante this time round, for example, pledging to try to wear two handmade garments each day rather than the one a day that they previously achieved. If you're a 'veteran' back for more self-stitched challengery, I would love to hear why you chose to sign up again. Please leave a comment if you have a spare sec. Let me know if there's any problems! I'm not formerly trained in the art of sharing good juju, my amateur status sometimes shows me up, particularly when good juju involves HTML! So peops, here it is! The moment you may or may not have been waiting for since last September, the opportunity to sign up for my next self-stitched clothing challenge: Me-Made-March’11. Some of you reading this will be aware of, or even participated in the previous challenges that ran last year along the same lines: Me-Made-May and Self-Stitched-September. Well, it's a (relatively) new year, and time for a new opportunity for those who wish to, to step up and see what they, and their clothes, are made of! The purpose of Me-Made-March '11 is to encourage those of us who make and/or refashion clothes to actually wear them in their everyday lives. Rather than spend hours on projects that then languish unworn and unloved in the bottom of a drawer, I believe we should be proud of our achievements and creations. Let's show ourselves as much as anyone else, that our efforts are more than just a pastime, that we have been slowly developing valueable skills that we can use to actually clothe ourselves, damn it! Let's learn to love our creations, to look past any flaws we can see in them (that probably no-one else would even notice). Why not take an opportunity to learn about what garments work best for our bodies and lifestyles so we can make more informed choices when sewing/knitting/refashioning etc. in the future? Participating in Me-Made-March '11 can do all of these things and more! Here's how it works: to sign up you copy the paragraph below then fill in the blanks as you choose best to create your own personal challenge contract. Then, post this personalised challenge contract in the comments section of this post and BAM! : You're all signed up! I would recommend you then post your contract on your blog if you have one, so your readers can see what you are up to. Please include a link back to this post so that anyone else who is interested can also get involved. From past experience, the more people involved, the merrier the experience is for all! It's up to you how you fill in the main section. Remember, this challenge is about upping the ante when it comes to wearing your own creations. So, for example, someone who often wears something made by themselves might choose to endeavour to wear two self-stitched garments each day. 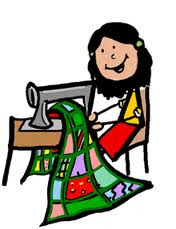 Someone who has less experience of garment making under their belt may endeavour to wear one self-stitched garment or self-made accessory each day. If you want to include self-made accessories, bags or jewellery, then do it. If you regularly wear refashions but would like to push yourself to wear more sewn/knitted/crochetted from scratch garments, then fill in the contract as such. If you regularly wear sewn/knitted/crochetted from scratch garments but would like a push to make yourself tackle the pile of potential refashions you have been planning but not got round to, then fill in the contract that makes refashioning a focus for the month. Gettit? Do what you want, just make it challenging! Then what? Then relax, congratulate yourself and maybe do a little planning. 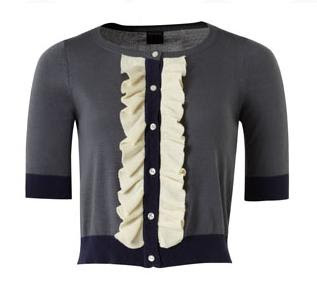 You may want to think about the 'holes' in your self-made wardrobe. You may want to pick up that half-finished project that you need a push to complete. Just see where the challenge takes you. I will be creating a Me-Made-March '11 Flickr group in the very near future that you will be able to sign up to, if you wish, where you can upload your daily self-made garments/outfits pics and see each others'. The Flickr group will also have the ability to host 'discussions' on whatever related topics you wish to discuss. Look out for an annoucement on this blog about the Flickr group soon! I will also be creating a jazzy little button that you can apply to your own blog, if you have one, to advertise your participation in this challenge. It will provide a ping-back to this post so you don't need to explain directly the idea and purpose of Me-Made-March '11 repeatedly. Look out for that in the near future also. So, please leave a comment or email me at sozoblog (at) gmail (dot) com if you have any queries or concerns. Otherwise, all I have to say is: Who's with me?! 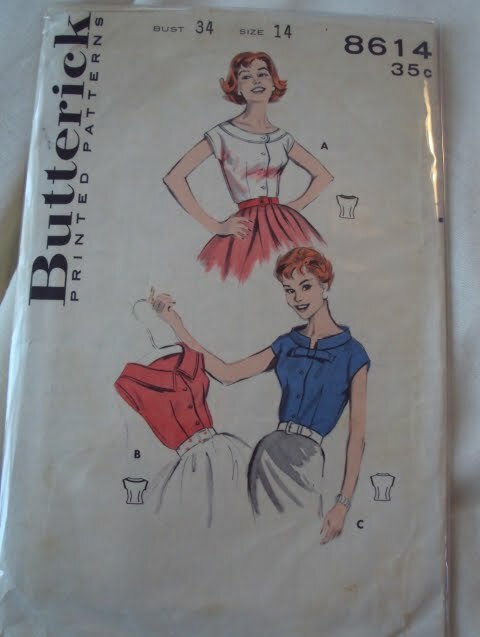 Like many sewers if questioned on the subject, probably the most influencial factor in me starting sewing was my mum. 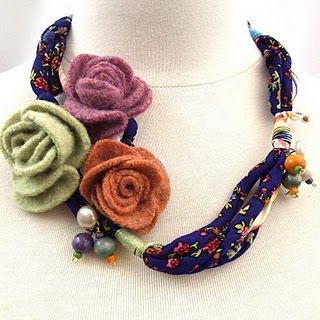 I grew up surrounded by scraps of fabric, ribbons, buttons and beads. She let me amuse myself with these things, and I guess it was through the playing and experimentation that I learnt to use these materials to express myself. On a different but related subject, if I really analysise my love of vintage sewing patterns, fabric and notions, I think it is the connection it gives me to the lives of women in the past that I love, particularly my mother and grandmothers. This is a subject I would like to come back to and elaborate upon in the future. However, today I would like to share with the (edited) fruits of an email interview I have been conducting with my mum to find out more about the role sewing played in the lives of young women in Southern England in the sixties. Me: What was your first sewing project? 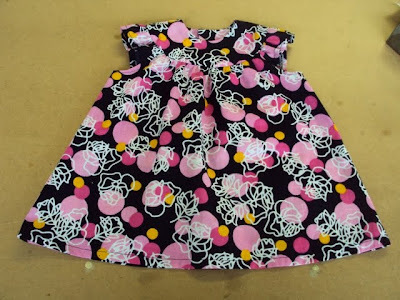 Mumma E: My first clear memory of me sewing is when I was 9 or 10 when I made myself a summer skirt. Fabric was gingham (can't remember the colour) bought with my pocket money from Peter Jones Stores in Holloway Road, London. 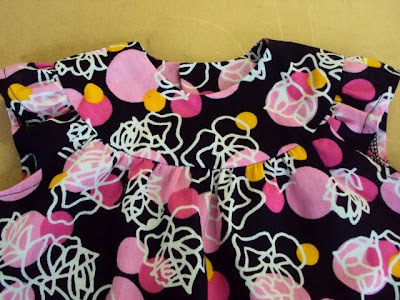 It was a very simple skirt gathered onto a waistband. I made it by hand and I have no idea what prompted the activity. Mumma E: The next major memory was early/mid 60s when I was 14 or 15. I was a Mod and had my finger well and truly on the pulse of fashion. I liked to be ahead of the game and so I made most of my outfits but could only wear them once or twice because stuff went out of fashion that quickly. Fabric was bought on Pitsea or Basildon market (my mum had moved with her parents from London to Essex by then) on Saturday morning. The outfit would then be knocked up very quickly (and probably very badly) in the afternoon and worn at the Locarno for the dance on Saturday night. Two memorable outfits were the nightdress dress - layers of grey blue frills on a plum colour shift and an A line dress in some plum colour fabric with bell sleeves with holes cut in the length of the sleeve (very Courreges). Me: Why did you sew your going-out clothes instead of buying them RTW? Mumma E: Mostly because of having little money but desperately wanting to be in fashion - but there was of course a culture, both generally and especially in my family of making clothes so it was quite an obvious thing to do. Also fabric and patterns were cheap and readily available. Me: Did any of your friends sew their own clothes when you were teenagers? Mumma E: Both my best friends did and one of their mothers was a very good dressmaker too so she had double my wardrobe. Me: I detect no lingering hint of envy, Mum! Did you make anything else around this time, aside from things to do out dancing in? Mumma E: I made a dress to submit for my needlework 'O' level which was gorgeous. Made from a Mary Quant paper pattern it was grey pinstripe wool with contrast button stand and cuffs and I remember having a real battle with my teacher over the length of the skirt who thought that the mini was a very transitory fashion and I would be sorry that I made it that short! Me: You studied at the London College of Fashion didn't you? Mumma E: Yes. The outfit I made for my interview for the London College of Fashion in 1967 was equally as short as the grey pinstripe wool one. This outfit was an orange wool A-line wrapover skirt with the edge bound in dark green and I dyed a shirt the same colour to match. Well it must have worked 'cos I got in. The length of my skirts then got ridiculous. Because they were so short I made matching hot pants to wear underneath otherwise I would have been arrested! The making of garments then slowed up a bit - so much college work and I was working at the weekends too so had much less time. But I did make use of a suit I made at college when I used it as my going-away outfit when I got married in '71. Beautiful rust coloured wool bought from the local market with a collar of exactly the same shade velvet. And as you know I also made my wedding dress - very simple, cream colour wool A-line dress. Me: I did indeed know that, in fact you recently celebrated your's and Dad's Ruby wedding anniversary, congratulations! 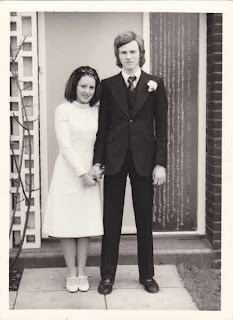 So, forty years after the event, what can you tell me about making your wedding dress? Did you have any help? Any last minute panics? 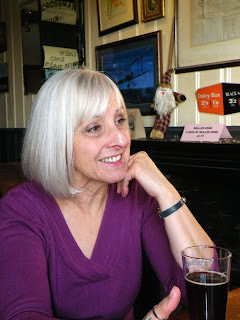 Mumma E: At the time I was the manageress of the fashion workroom in a department store called Keddies. I did have some help at the end to finish my wedding dress but that was only because one of my workers got fed up with my slow progress and seeing it laying around, so one day when I went out for an extended lunch, I came back to find it virtually finished! It was one of the other workers there who crocheted the long waistcoat that went over it. As for your last question, I cannot think of any last minute panics over finishing something other than when I was working in the workroom and we had forgotten to alter a bride's dress until she phoned and asked if it was ready! She had ordered it months previously and it was left at the back of the rail - you have never seen an alteration done so quickly! Thanks very much to Mumma E for taking the time to share her early sewing history with me, for exposing me to fabric in the first place and for listening to all my sewing project gripes over the years!